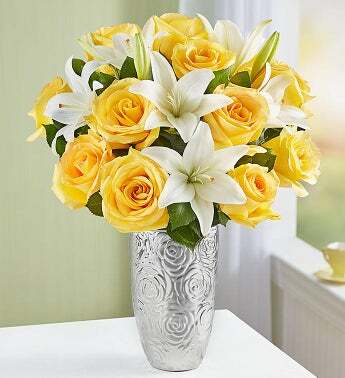 A dozen of our freshest yellow roses and a trio of pristine, white lilies create an irresistibly elegant bouquet that is simply lovely. Fair Trade certification ensures that workers on large-scale flower farms have access to unions, receive better wages, and work under safe labor conditions with protective equipment and proper training. Growers are able to keep the best workers because of these benefits, leading to better productivity and better flower quality. In addition, Fair Trade certification provides workers vital financial support in the form of the Fair Trade premium: 10 percent of the commercial price of every stem sold is allocated to a development fund that gives workers the opportunity to invest in the future of their communities.